Procraftination: Dynamic Duos #68 - Hello! Hello! Are you ready for the new color challenge at Dynamic Duos #68? We're starting out with one of my favorite colors...Perfect Plum. And you get to choose the other half of the duo. Here's the graphic for this week's challenge. I had no idea what color I was going to pair with Perfect Plum. But, my friend Kris pulled out her SU Color Coach and I saw a combo that I would never have thought of. Perfect Plum and More Mustard. What? As it turns out...I love it! This card was so much fun to create. Well, that is, once I finally decided on a theme/layout. I started out in a completely different direction, but I could NOT get it to work. Then I remembered an ink splatter technique I'd seen recently. It worked! After adhering the strip of kraft cardstock, I pulled out my SU watercolor crayons (discontinued now), and wet a small paintbrush with water. I loaded it up with color - plenty of water & crayon - then started tapping the brush as I held it over my card. I used 2 crayons...Perfect Plum & More Mustard, using 2 different size brushes in order to vary the size of the droplets. 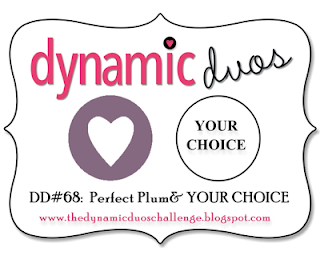 Hey, now it's time for you to click over to Dynamic Duos and see what the rest of the Dynamos have created. Just follow THIS link. Ok? I would never have thought to put more mustard together with Plum either, but it looks fantastic :) Awesome card, Susie! I love this colour combo and all those lovely splatters Susie! LOVE your card...it's so pretty...thanks for the link to the water splatter technique.. Misters have never worked for me, but love the fine splatter that the pencils and brushes create! Oh, what a FUN card, Susie! The plum and mustard go very well together! Great ink splatter technique and love those arrows, too! Good ole' color coach to the rescue and I really like the plum with the mustard. Cute card! Oh, I love this Susie and wouldn't have thought to use this color with more mustard either, but it works out great. Will have to try the splatter technique - LOVE it ! !